The crypto market appears to have seen a small resurgence over the course of this week, with Bitcoin back to testing $4,000 again, Ethereum testing $150 once again and most altcoins seeing solid green gains over the past 48 hours. The most notable statistic is the 24 hour trading volume. While the market cap has climbed over $10 billion since Sunday, also a huge feat. The trading volume broke a new 10 month high following its previous high at this range in April 2018. Based on Coinmarketcap statistics, The trading volume over the past 24 hours supassed $34.7 billion. That is a $14 billion increase from seven days ago. The massive spike in volume is definitely encouraging, especially after a 10 month trading volume under $130 billion. The top traded coins saw Bitcoin, Ethereum and USDT dominate the trading over the course of the 24 hours. Most notably, was USDT that had $9.6 billion in trading volume. Just a little less than Bitcoins $10.1 billion. 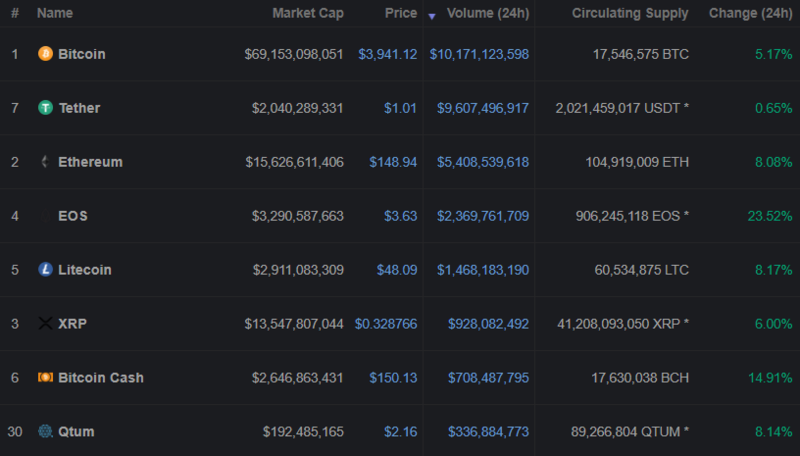 Ethereum had $5.4 billion and EOS saw massive gains, pushing its trading volume to the fourth highest with $2.3 billion. The top four totalled $27.47 billion of the total trading volume. Meaning only $7.2 billion was traded between other altcoins. It would almost appear as if buyers are jumping back into bitcoin from stable coin USDT. Regardless, the trading volume increase is a positive sign and could potentially continue if Bitcoin breaks over $4,000 this week. All eyes will be on the market to see if it can hold its positive gains this week.